Tag Archives for " Brauertag Muenchen "
Sometimes, you act on a spur of the moment and you discover fate has a plan for your life. And so it was then, that I made a spur of the moment decision to get off at Odeanplatz U-Bahn station instead of my original intended destination of Karlplatz. There was no particular reason apart from a inkling to get out here when the train stopped. As I walked up the steps, It was to my delight that I discovered a mini beer festival was going on: “München Brauertag 2016”. 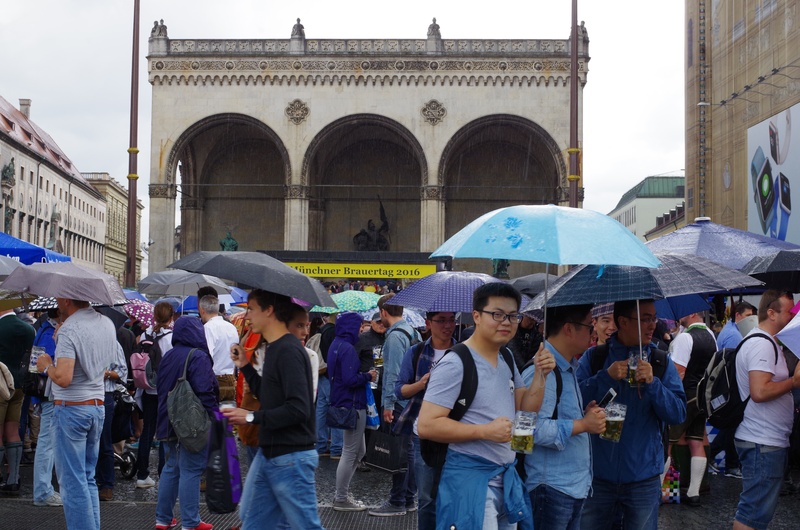 They had representatives from all the major Munich brewers – Paulaner, Lowenbrau, Augusteiner, Spaten etc with many of the locals all dressed up for the part. Thinking to myself, “When in Roam, do as the Roamans do” so I must now now have a beer. As I went to pay, the assistants waived me away saying “Nein” so I thought they were closed. However, I then understood what they were telling me – it was a FREE beer festival. Yohooo !!!!! What an excellent welcome to Munich. Wunderbar! I found out that 4,000 litres of beer are given away free. Oh, and if you are thinking of going for 2017. Don’t. It occurs every two years so next one is 2018.